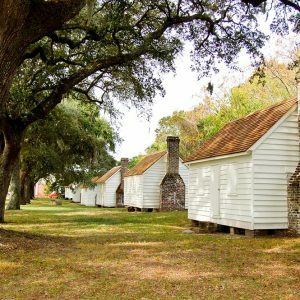 McLeod Plantation includes a plantation house and one of the most intact rows of slave houses in the state. In 1860, 74 slaves lived in 26 cabins on the cotton plantation. Five of these wood frame slave cabins remain today. During the Civil War the plantation served as unit headquarters for Confederate forces. When they evacuated Charleston in February 1865, Union troops used the plantation. Among the units camped there were the 54th and 55th Massachusetts Volunteer Regiments. During Reconstruction the McLeod Plantation House served as headquarters for the Freedmen’s Bureau for the James Island district.